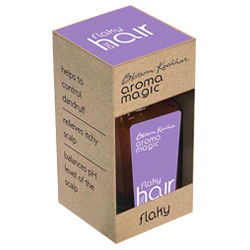 Buy Aroma Magic Flaky Hair Oil Control Dandruff & Relieves Itchy Scalp - Aromatherapy & Hair Oils - Hair Care Aromatherapy Treatment. Helps to control dandruff with its natural anti bacterial & anti fungal properties. Helps to control Dandruff. Relieves Itchy Scalp. Balances pH level of Scalp.